TAIPEI, Taiwan, June 28, 2015 (TEIA) – Taiwan Power Company, the state-owned utility that operates Taiwan's three nuclear power plants, proposed a pilot project late last year to send 1,200 spent fuel bundles overseas for reprocessing. The company has requested a budget of NT$11.25 billion (US$356.4 million) to manage eight percent of its total used fuel rods. Under the plan, one-fifth of the sent volume would be shipped back to Taiwan for final disposal, in the form of vitrified waste encased in glass. But the plan has run into opposition in Taiwan from both lawmakers and environmental groups. Legislators think that the overseas disposal cost is too high and reprocessing may not be the answer to Taiwan’s nuclear waste management. 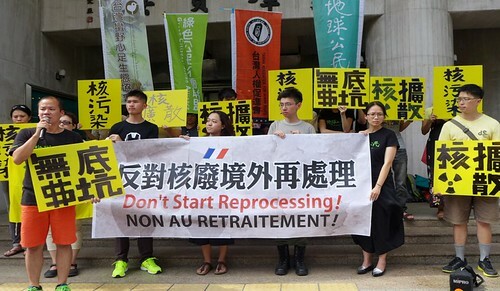 Environmental groups worry that reprocessing is used by Taipower to extend the lifespan of two existing nuclear plants as the spent fuel pools at the facilities are nearing their holding capacity. They reached 97 percent of maximum capacity in January 2015. The budget is frozen for three months from June 11, 2015 while it is reviewed by a special legislative panel. Concern over the safety of Taiwan's nuclear plants has grown since Japan's Fukushima Daiichi nuclear disaster in March 2011, because Taiwan, too, is prone to typhoons, tsunamis and earthquakes. 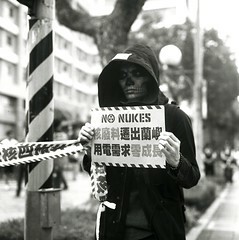 The latest polls suggest that the anti-nuclear camp finds support from 42 percent of the 23.5 million Taiwanese, a percentage equivalent to the support the pro-nuclear camp attracts. Under public pressure, the government has pledged to make Taiwan a nuclear-free island and decommission all three nuclear plants at the end of their authorized 40 years of operation, dates that fall between 2018 and 2025. But because the radioactive waste storage sites will reach capacity by 2016, Taipower says the company may be forced to shut down two of the plants earlier than scheduled. In that event, Taiwan may face electricity shortages and rationing. But civil society groups including Green Citizens Action Alliance, Citizen of the Earth (Taiwan), and Mom Loves Taiwan believe that as long as the government implements plans to reduce energy use in residential as well as commercial and industrial sectors, Taiwan will still get sufficient power.As of 2014, Taiwan's three nuclear reactors provided 18.41 percent of the country’s overall power generation, while renewable energy accounted for only 2.86 percent, said Taipower. They say investing in energy conservation is a more economical option than reprocessing nuclear waste overseas. Still, radioactive waste is accumulating. At the end of 40 years of operation, the three operating nuclear power facilities in Taiwan will have produced 4,950 metric tons of spent nuclear fuel. The need to find nuclear waste disposal sites has never been so urgent. But the last time the government chose a dumping site, its actions were deemed deceitful. From 1982 to 1996, about 100,000 barrels of nuclear waste were stored at a facility off Taiwan's southeast coast on Lanyu Island. Prior consent was not sought from Lanyu's aboriginal residents, and no notice was given to them of the nuclear waste stored there. Originally, the plan was to dispose of the toxic radioactive material in a nearby ocean trench, but this idea was abandoned when dumping nuclear waste in the ocean was prohibited by international agreement after 1993. After years of protests, the government promised 12 years ago that the radioactive waste will be removed from Lanyu as soon as a permanent storage facility is available. To date, the government has not honored this promise. Currently, government authorities are conducting 12-year geological assessments (2005-2017) to determine suitable siting regions for the nuclear waste, which they plan to have constructed by 2055, according to Atomic Energy Council. In the Spent Nuclear Fuel Final Disposal Program Plan, approved by the Atomic Energy Council in July 2006, the initial tasks emphasize investigation and characterization of potential host rocks, development of disposal technology, and performance and safety assessment of repository facilities. The public perception of living close to a radioactive waste dump is not properly taken into account in the planning document. In fact, Taipower tried to hide the entire siting plan from the public. In October 2011, Taipower began drilling a deep hole for a nuclear waste storage facility located 500 meters underground for evaluation. But not only had Taipower not informed the local government of these activities, but it told the village that the drilling was only to make tunnels for its own facility. The same thing happened again in early 2015 with another region in Yilan County's Dananao area, giving the spent nuclear fuel final disposal program a bad name. However, high-level radioactive waste management does not have to be a clandestine government plan. Examples of public consent-based processes for nuclear waste siting do exist. Somewhat differently in Sweden, a competition was organized between two technically-approved communities. In that case, both the winning and losing Swedish communities ended up sharing the investment benefits in infrastructure, business development, and education, according to Araújo and Taebi. They claim that procedural fairness and consent through voluntary self-nomination are essential for public buy-in to nuclear waste disposal, entailing stakeholder engagement at local and national levels. Consent-based approaches require time, sometimes as long as two decades. Taipower and the Taiwanese government need improvement in this area, according to the island’s environmental activists. Green Citizens Action Alliance researcher Hsu Shih-ya says that successful nuclear waste management programs view nuclear waste policy as a social issue, not just as a technical problem. She believes that public debates, grounded in civic reasoning, should be incorporated into the nuclear waste disposal decision-making process to help promote knowledge and involvement of all stakeholders.